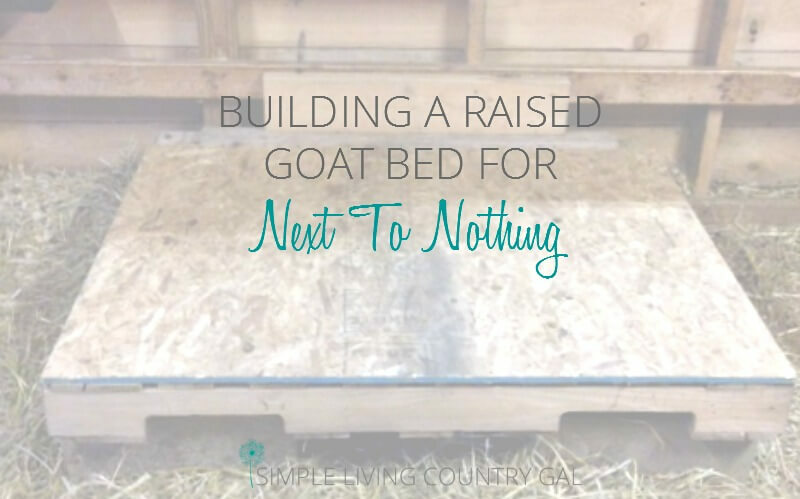 If you are looking for an inexpensive way to get your goats off of the cold ground this winter, then this article on building a raised goat bed DIY is for you! The last few mornings when I went out to do chores I found my Nubian goats huddled together sleeping standing up. This is unusual for them so I went over and checked my Alpine goats and they were spread out on the ground just as comfortable as could be. Even my bucks were fine, nope not one complaint was heard out of them. Suddenly I realized this must be a “Diva” thing. They seemed insulted that I would even suggest that they lay down on the chilly ground. While there is nothing wrong when goats sleep standing up, it does tug on my “need to please” heartstrings. So, now all I had to do was come up with a solution that was quick and inexpensive. If the Diva’s found the ground too cold to sleep on, then I needed to find a way to get them up off of the ground. 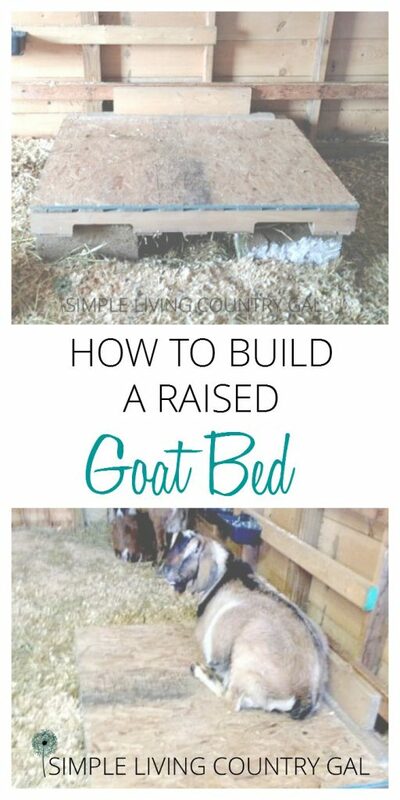 And that is where my idea for a raised goat bed DIY was born. I turned to Pinterest to see what I could find. As you can imagine there were hundreds of pretty elaborate options to choose from! There were tri-level bunk beds (I kid you not) and raised platforms with ramps and bridges that led to other platforms. Even though these ideas where tempting, they would, unfortunately, all would cost a small fortune and this was not something I could do on my cheapskate budget. Then Handy Man Hubby, who already have labeled me as an overindulgent goat owner, came up with a simple yet effective plan. He suggested we build a platform out of scrap pieces of pallet wood that we just happen to have lying all around our homestead. I was immediately on board since I love to make something out of nothing! Before we dive in, I would like to apologize for the quality of the photos!! I should have taken more…newbie blogging mistake! First, we took a pallet we had that was in pretty good shape. 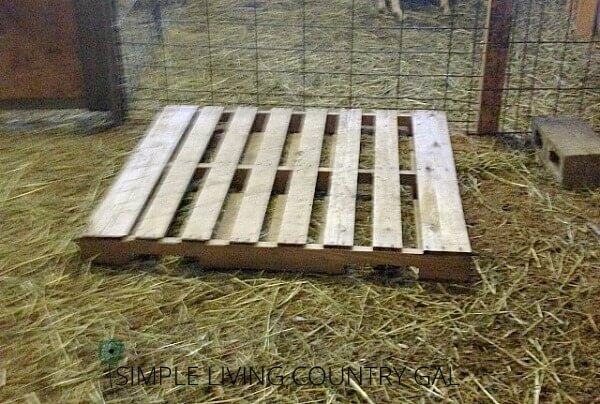 Ninja Tip: FYI, it is quite easy to get nice looking pallets for free. Many businesses actually have a hard time getting rid of less than perfect ones and will gladly give them away if you just ask. Sorry, the next few photos are a bit blurry, not sure what happened ….let’s just blame the camera crew, shall we? We then took a sheet of wood and attached it to the top in order to cover spaces between the slats. 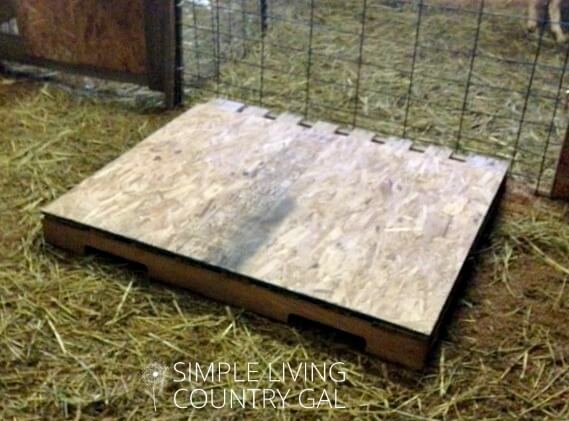 The concern here was that the goats could possibly get a hoof caught in those openings causing injury. This cover will just give an added layer of protection for the goat herd. We realized at this point we needed to get it higher off the ground and find a way to keep it from moving around especially if everyone decides to get on it at once. We repositioned it on an interior wall so it could be nailed securely in place. We then placed 4 cinder blocks to raise it up off the ground. Goats love to be “up”, even if it’s only a few inches to us, it’s a mile to them. 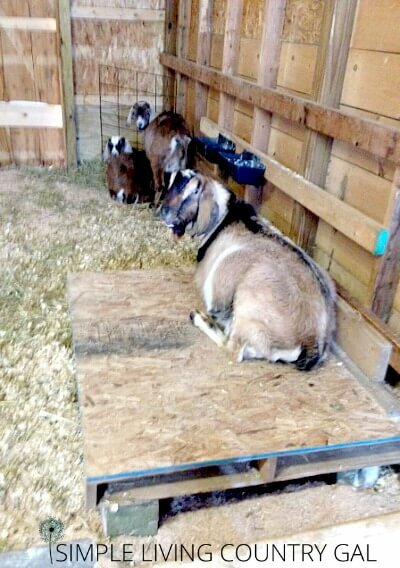 Those cinder blocks made that goat bed more appealing and it wasn’t long before everyone was there to try it out. Give them space and time to try things out. Goats hate change and it can take them a bit to get acclimated to anything new. Be patient and leave them alone to explore things on their own time. For our herd, it took just a few hours for our big Buck, Toby, to decide that this bed was his and that is where he spent most of that first winter! 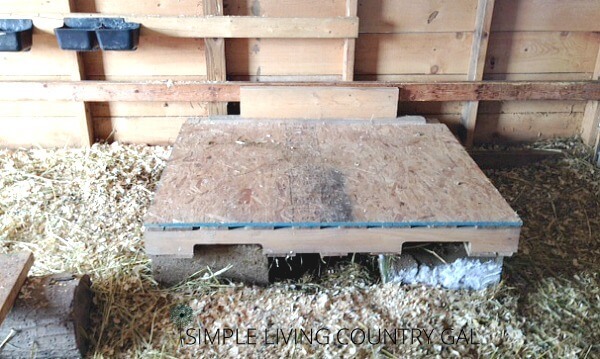 Making something out of nothing is a tool most homesteaders have. Look around your home before heading out to the store and try to make your supplies fit the project. Looking for more? You can find all of my Raising Dairy Goat posts here! « Essential Oils. My Skeptical Journey. Tks for idea! I agree its probably alot warmer off ground. I live near buffalo ny gonna set up for my goat. Oh wow. I thought we were the only ones who did this! Lol. We have had issues with flooding in the last year or so, so we were trying to get the goats up out of the mud. Our barn pens and shelters were a mess. The goats love their new dry beds. Yes, mud is my number one issue where we live! Last year we invested in river rock to lay down in the really wet areas and it has helped immensely.